Hyde Marine, Inc. is a world leader in ballast water treatment systems (BWTS) designed to control the spread of non-indigenous aquatic organisms. Owners and operators committed to operating their vessels in a responsible, sustainable and economical way rely on the Hyde GUARDIAN Gold™ BWTS to provide an IMO type-approved solution to maximize their ship’s environmental compliance. Hyde Marine is a pioneer in early ballast water research and continues its position as a technology leader and an integral part of Calgon Carbon UV Technologies. The Hyde GUARDIAN Gold BWTS is an IMO type-approved ballast water management solution offering the smallest footprint on the market for easy installation. This economical shipboard treatment inactivates aquatic organisms and controls sediment in ballast water as required by existing and pending regulations. The Hyde GUARDIAN Gold BWTS combines auto-backflushing filtration followed by reliable ultraviolet (UV) disinfection in a robust, automatic, chemical free process. UV treatment performance is unaffected by water salinity or temperature and does not produce hazardous byproducts or increase corrosion risk. The totally chemical-free Hyde GUARDIAN Gold system offers a compact design, low power consumption scaled according to capacity and low pressure drop. These advantages make it a technically attractive and cost-effective solution for any type of vessel. The Hyde GUARDIAN Gold system is suitable for a broad range of treatment requirements based on our many years of experience, and can be retrofitted in-situ to existing vessels or installed in newbuilds with no downtime. With more than ten years of shipboard operating experience (aboard the "Coral Princess") and as the first system accepted into USCG STEP, Hyde Marine has sold more than 320 systems for all vessel types and sizes. It also has the longest history and most experience with retrofit projects and installations. Hyde Marine is a market leader in the large emerging BWT market. The Hyde GUARDIAN BWTS received International Maritime Organization (IMO) type approval in April 2009, and was the one of the first BWTS to receive USCG AMS approval in April 2013. In December 2013, the newly launched Hyde GUARDIAN Gold BWTS received IMO type approval. Hyde Marine traces its origins to the Hyde Windlass Company established in Bath, Maine, in 1865. The company established a reputation as a reliable and respected supplier of equipment and services to the marine market with deck machinery, steering systems, oil/water separators and marine chemicals. As early as 1995, Hyde Marine became aware that the ballast water in ships was carrying thousands of species of aquatic animals and plants. These invasive organisms were creating problems for the marine environment and human health in and around the Great Lakes area, threatening the economies that depend on healthy aquatic ecosystems. Hyde Marine’s close association with the Great Lakes shipping community and focus on marine environmental problems led to the company’s early involvement in testing of BWT technologies as a partner with the University of Michigan. This effort led directly to Hyde Marine’s participation in the Great Lakes Ballast Technology Demonstration Project (GLBTDP). This program conducted early tests of filtration technology for BWT aboard a Canadian Great Lakes bulk carrier, the Algonorth. These early experiments and further shipboard and land-based testing of many different types of BWTS configurations led directly to the development of the Hyde GUARDIAN BWTS. In 2010, Calgon Carbon Corporation (NYSE: CCC) acquired Hyde Marine, Inc. as part of its UV Technologies Division. This acquisition combined the considerable worldwide drinking and wastewater treatment expertise of Calgon Carbon with Hyde Marine’s many years of experience in shipboard ballast water systems. Calgon Carbon has more than 25 years of experience in the use of UV technologies for disinfecting drinking water and municipal wastewater, treating industrial wastewater and remediating contaminated water. Calgon Carbon UV systems are installed worldwide and treat more than 15 million metric tonnes of water per day. Today, Hyde Marine operates out of a modern 60,000ft² facility near Pittsburgh, Pennsylvania, where the company designs, supports and manufactures the Hyde GUARDIAN BWTS. Hyde Marine, a wholly-owned subsidiary of Calgon Carbon Corporation, has been selected as a strategic supply partner for ballast water treatment (BWT) systems by Edison Chouest Offshore (ECO) for use on its extensive fleet of vessels. The Hyde GUARDIAN Gold™ Ballast Water Treatment System (BWTS) is the new effective and reliable solution that combines efficient filtration and ultraviolet (UV) disinfection. Standard systems are available for flow rates from 60m³/hr up to 6,000m³/hr. The Hyde GUARDIAN Gold™ ballast water treatment system (BWTS) is an IMO type-approved ballast water management solution offering the smallest footprint on the market for easy installation. This economical shipboard treatment inactivates aquatic organisms and controls sediment in ballast water, as required by existing and pending regulations. Hyde Marine Inc, a wholly owned subsidiary of Calgon Carbon Corporation (CCC), announced today it has established a memorandum of understanding (MoU) with Singapore-based Keppel Shipyard and SEAQUEST Marine Systems for the installation of the chemical free Hyde GUARDIAN Gold™ Ballast Water Treatment System (BWTS) in international markets. Hyde Marine, one of the world's leading ballast water treatment technology companies, will display its Hyde GUARDIAN Gold™ HG250G ballast water treatment system (BWTS) at the upcoming shipbuilding, machinery and marine technology (SMM) international trade fair, 9-12 September, in Hamburg, Germany at Hall A1, Stand 413. Hyde Marine continues its ongoing, no-cost webinar series on 4 September with a special educational topic entitled "Ballast Water Treatment System Installations: Lessons Learned" aimed at helping shipowners and operators properly select, install and maintain ballast water treatment (BWT) systems. Hyde Marine today announced it will begin using a new ballast water test system, B-box, recently made available from the Royal Netherlands Institute for Sea Research (NIOZ) to help ballast water treatment (BWT) technology companies conduct accurate analysis regarding the concentrations of chemicals or organisms present in ballast water. Hyde Marine announced today it has launched an agreement with Goltens Green Technologies division to help shipowners determine how to best fit the chemical free Hyde GUARDIAN Gold™ Ballast Water Treatment System (BWTS) onto their existing vessels. Hyde Marine, Inc., a wholly owned subsidiary of Calgon Carbon Corporation, announced it has delivered more than 200 Hyde GUARDIAN® Ballast Water Treatment Systems (BWTS) and commissioned more than 100 for operation on a variety of vessels around the world, based on sales of more than 275 units. 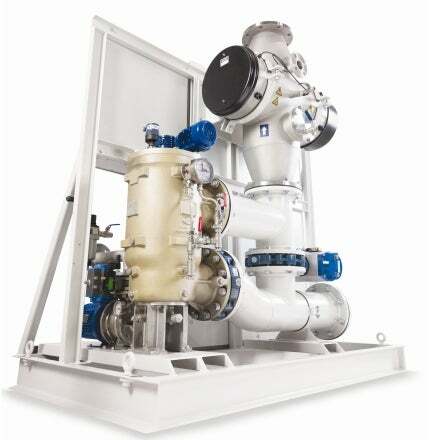 Hyde Marine, Inc., a wholly owned subsidiary of Calgon Carbon Corporation, has introduced the Hyde GUARDIAN Gold™ Ballast Water Treatment System (BWTS), which offers the smallest footprint of any BWTS in the maritime industry, at Marintec Shanghai, China. Hyde Marine, a wholly owned subsidiary of Calgon Carbon Corporation (NYSE: CCC), announced it has delivered more than 200 Hyde GUARDIAN® Ballast Water Treatment (BWT) Systems and commissioned more than 100 for operation on a variety of vessels around the world, based on sales of more than 275 units. Hyde Marine, a wholly owned subsidiary of Calgon Carbon Corporation (NYSE: CCC), announced today it has established a partnership agreement with Cammell Laird, the largest shipyard in the United Kingdom, for installation of the chemical free Hyde GUARDIAN® (HG) Ballast Water Treatment (BWT) System. Hyde Marine will showcase a skid-mounted Hyde GUARDIAN® HG150 Ballast Water Treatment System (BWTS) suitable for small-to-medium Offshore Service Vessels (OSV) and ferries at booth R4136U in Hall 4 (second floor) in collaboration with Marcon West, during Neva, September 24-27, 2013 in Saint Petersburg, Russia. Hyde Marine, a pioneer of mechanical separation and UV disinfection as a ballast water management solution, and producer of the Hyde GUARDIAN®, will be attending Nor-Shipping 2013. Hyde Marine, a wholly owned subsidiary of Calgon Carbon Corporation, announced today that it has named W&O Supply as its exclusive sales distributor in the US and Canada for Hyde GUARDIAN® Ballast Water Treatment Systems (BWTS). Calgon Carbon Corporation announced today that its Hyde GUARDIAN® Ballast Water Treatment System (BWTS), developed and manufactured by its wholly owned subsidiary, Hyde Marine, Inc., became one of the first BWTS to earn Alternate Management System (AMS) approval from the United States Coast Guard (USCG). Hyde Marine announces the launch of its new website, which is designed to better educate the marine industry about the company's pioneering Hyde GUARDIAN® Ballast Water Treatment System (BWTS). HydeMarine.com allows users to easily navigate the Hyde Marine Academy section, which serves as an educational clearinghouse for technological updates and maritime news. Calgon Carbon Corporation's wholly owned subsidiary, Hyde Marine, Inc.®, announced today that its Hyde GUARDIAN® Ballast Water Treatment System (BWTS) HG600 unit will be installed on the largest icebreaker in the FSUE "Rosmorport" fleet - the 22600 project, a 25 mWt-power diesel vessel. Calgon Carbon Corporation announced that its subsidiary, Hyde Marine, has been awarded a contract to supply a total of six Hyde GUARDIAN® Ballast Water Treatment (BWT) Systems for two LR2 Aframax tankers being constructed by the SPP shipyard in South Korea for ship owner OSG.